The wintergreen-spice flavored 5 mg/5 mL Oral Solution contains bitterness modifier, citric acid, D&C Yellow No. 10, FD&C Red No. 40, flavoring, polyethylene glycol, propylene glycol, sodium citrate, sorbitol, and water. In animals diazepam appears to act on parts of the limbic system, the thalamus and hypothalamus, and induces calming effects. Diazepam, unlike chlorpromazine and reserpine, has no demonstrable peripheral autonomic blocking action, nor does it produce extrapyramidal side effects; however, animals treated with diazepam do have a transient ataxia at higher doses. Diazepam was found to have transient cardiovascular depressor effects in dogs. Long-term experiments in rats revealed no disturbances of endocrine function. A series of rat reproduction studies was performed with diazepam in oral doses of 1, 10, 80 and 100 mg/kg. At 100 mg/kg there was a decrease in the number of pregnancies and surviving offspring in these rats. Neonatal survival of rats at doses lower than 100 mg/kg was within normal limits. Several neonates in these rat reproduction studies showed skeletal or other defects. Further studies in rats at doses up to and including 80 mg/kg/day did not reveal teratological effects on the offspring. In humans, measurable blood levels of diazepam were obtained in maternal and cord blood, indicating placental transfer of the drug. Diazepam is contraindicated in patients with a known hypersensitivity to this drug and, because of lack of sufficient clinical experience, in children under 6 months of age. It may be used in patients with open angle glaucoma who are receiving appropriate therapy, but is contraindicated in acute narrow angle glaucoma. Diazepam is not of value in the treatment of psychotic patients and should not be employed in lieu of appropriate treatment. As is true of most preparations containing CNS-acting drugs, patients receiving diazepam should be cautioned against engaging in hazardous occupations requiring complete mental alertness such as operating machinery or driving a motor vehicle. As with other agents which have anticonvulsant activity, when diazepam is used as an adjunct in treating convulsive disorders, the possibility of an increase in the frequency and/or severity of grand mal seizures may require an increase in the dosage of standard anticonvulsant medication. Abrupt withdrawal of diazepam in such cases may also be associated with a temporary increase in the frequency and/or severity of seizures. An increased risk of congenital malformations associated with the use of minor tranquilizers (diazepam, meprobamate and chlordiazepoxide) during the first trimester of pregnancy has been suggested in several studies. Because use of these drugs is rarely a matter of urgency, their use during this period should almost always be avoided. The possibility that a woman of childbearing potential may be pregnant at the time of institution of therapy should be considered. Patients should be advised that if they become pregnant during therapy, or intend to become pregnant, they should communicate with their physicians about the desirability of discontinuing the drug. Manifestations of diazepam overdosage include somnolence, confusion, coma and diminished reflexes. Respiration, pulse and blood pressure should be monitored, as in all cases of drug overdosage, although, in general, these effects have been minimal following overdosage. General supportive measures should be employed, along with immediate gastric lavage. Intravenous fluids should be administered and an adequate airway maintained. Hypotension may be combated by the use of norepinephrine or metaraminol. Dialysis is of limited value. As with the management of intentional overdosage with any drug, it should be borne in mind that multiple agents may have been ingested. 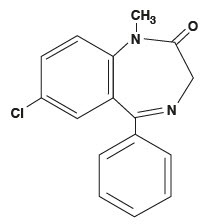 If diazepam is to be combined with other psychotropic agents or anticonvulsant drugs, careful consideration should be given to the pharmacology of the agents to be employed–particularly with known compounds which may potentiate the action of diazepam such as phenothiazines, narcotics, barbiturates, MAO inhibitors and other antidepressants. The usual precautions are indicated for severely depressed patients or those in whom there is any evidence of latent depression; particularly the recognition that suicidal tendencies may be present and protective measures may be necessary. The usual precautions in treating patients with impaired renal or hepatic function should be observed. In elderly and debilitated patients, it is recommended that the dosage be limited to the smallest effective amount to preclude the development of ataxia or oversedation (2 mg to 2 1/2 mg once or twice daily, initially, to be increased gradually as needed and tolerated). Side effects most commonly reported were drowsiness, fatigue and ataxia. Infrequently encountered were confusion, constipation, depression, diplopia, dysarthria, headache, hypotension, incontinence, jaundice, changes in libido, nausea, changes in salivation, skin rash, slurred speech, tremor, urinary retention, vertigo and blurred vision. Paradoxical reactions such as acute hyperexcited states, anxiety, hallucinations, increased muscle spasticity, insomnia, rage, sleep disturbances and stimulation have been reported; should these occur, use of the drug should be discontinued. Because of isolated reports of neutropenia and jaundice, periodic blood counts and liver function tests are advisable during long-term therapy. Minor changes in EEG patterns, usually low-voltage fast activity, have been observed in patients during and after diazepam therapy and are of no known significance. 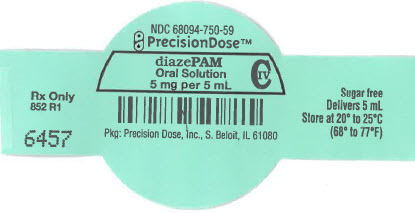 Diazepam Oral Solution is classified by the Drug Enforcement Administration as a Schedule IV controlled substance. Withdrawal symptoms, similar in character to those noted with barbiturates and alcohol (e.g., convulsions, tremor, abdominal and muscle cramps, vomiting and sweating), have occurred following abrupt discontinuance of diazepam. The more severe withdrawal symptoms have usually been limited to those patients who received excessive doses over an extended period of time. Generally milder withdrawal symptoms (e.g., dysphoria and insomnia) have been reported following abrupt discontinuance of benzodiazepines taken continuously at therapeutic levels for several months. Consequently, after extended therapy, abrupt discontinuance should generally be avoided and a gradual dosage tapering schedule followed. Addiction-prone individuals (such as drug addicts or alcoholics) should be under careful surveillance when receiving diazepam or other psychotropic agents because of the predisposition of such patients to habituation and dependence. Management of Anxiety Disorders and Relief of Symptoms of Anxiety. Depending upon severity of symptoms – 2 mg to 10 mg, 2 to 4 times daily. Symptomatic Relief in Acute Alcohol Withdrawal. 10 mg, 3 or 4 times during the first 24 hours, reducing to 5 mg, 3 or 4 times daily as needed. Adjunctively for Relief of Skeletal Muscle Spasm. 2 mg to 10 mg, 3 or 4 times daily. Adjunctively in Convulsive Disorders. 2 mg to 10 mg, 2 to 4 times daily. Geriatric Patients or in the presence of debilitating disease. 2 mg to 2 1/2 mg, 1 or 2 times daily initially; increase gradually as needed and tolerated. Because of varied responses to CNS-acting drugs, initiate therapy with lowest dose and increase as required. Not for use in children under 6 months. 1 mg to 2 1/2 mg, 3 or 4 times daily initially; increase gradually as needed and tolerated.